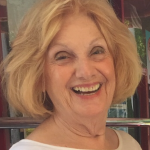 Shirley Bostancic, wife, mother, grandmother, great-grandmother and friend to many passed away on January 27, 2019 surrounded by her family. Shirley was preceded in death by her parents William and Minnie Hall, and her brother William. She is survived by her loving husband of 65 years , Jim Bostancic; son Michael Bostancic (Sara) of Newtown Pa.; daughter Margret O’Keefe (Gerry) of Midlothian VA.; son Marc Bostancic (Anne) of Matthews, NC; grandchildren Brian Bostancic (Heather), Steve Bostancic, Katie O’Keefe, Peter Bostancic, Sara O’Keefe and Molly Bostancic and great-granddaughter Lila Bostancic. Shirley was born on July 7, 1935 in Bellaire, Ohio and raised in Glencoe Ohio. She embarked on a life of travel and adventure when she and Jim married and began their 25 years of service in the United States Army. Together, as they raised their family, they traveled throughout the world and visited all 50 states. She was actively involved in the military community wherever she lived and after retiring to Yorktown in 1985, became a dedicated volunteer for Meals on Wheels and the York County Church Women United Food Closet. Kindness, generosity, positivity and love of family were Shirley’s ever- present qualities. She was loved by all and will be greatly missed. A memorial service will be held on Friday, February 1, 2019, at 11am at St Luke’s United Methodist Church, 300 Ella Taylor Road, Yorktown, VA. The family wishes in lieu of flowers expressions of sympathy take the form of contributions to the St. Luke’s food closet.